Well-balanced meals and snacks are both important for maintaining a healthy lifestyle. But whether it’s because you find yourself mindlessly snacking or because your meals aren’t keeping you as full as you’d like, sometimes you need something to keep you from desperately searching through your pantry. These foods allow you to cut down on your portions without missing a single thing, simply by helping you feel less hungry. Eating foods that suppress your appetite can make losing weight a much easier task. 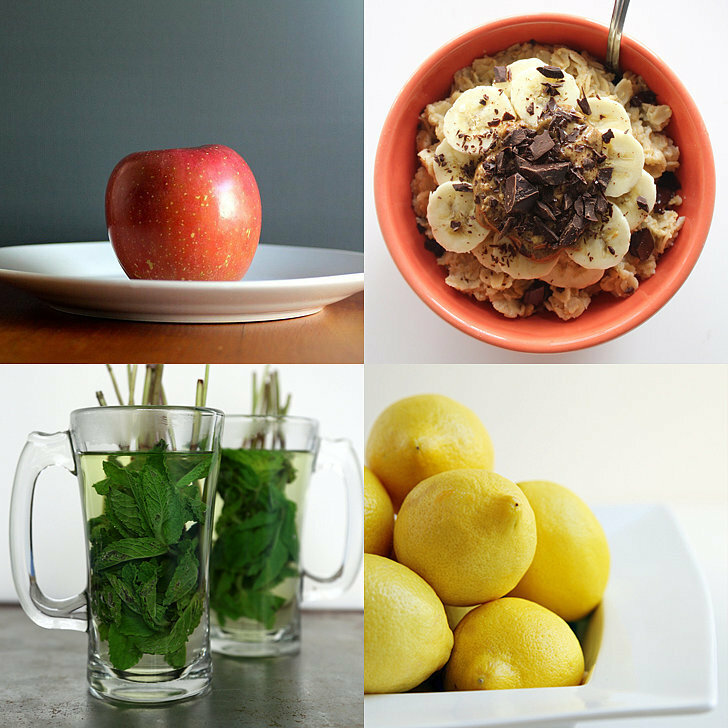 Here are 12 appetite-suppressing foods that keep you feeling full! Nuts don’t just contain healthy fats to help keep your cholesterol low — they are also good sources of appetite-killing fiber, which digests slowly so it stays in your stomach much longer than other carbohydrates. Try keeping a bag of trail mix nearby with an assortment of nuts as an alternative snack. The first and most important benefit of oatmeal is that it is high in fiber, which helps you feel full without staying in your system for too long. In fact, it helps maintain lower body weight simply because it helps other foods on their way out. Half a cup of edamame is only 95 calories but contains over eight grams of protein, making the baby soy beans a good snacking choice. An apple makes an ideal morning or afternoon snack; the fruit is a great source of fiber to keep you feeling full, and its high water content helps fill your belly, as well. Apples also contain pectin, which can help prevent blood sugar spikes that spur hunger. Find out more reasons apples should be part of your weight-loss plan here. Studies have shown that spicy food can help keep you fuller longer as well as increase metabolism. A recent study, for example, found that people ate 60 fewer calories (and burned about 10 more) when cayenne pepper was added to their tomato soup (compared with those who ate nonspiced soup). The smell of mint is not only calming but also an effective appetite suppressant. It may all be psychological but it works; sipping on mint tea, chewing sugar-free mint gum, or simply brushing your teeth can save you calories and may help you drop a pant size — unfortunately, mint chocolate chip ice cream does not count. In theory, chia seeds are supposed to expand in your belly, helping you to feel full, eat less, and ultimately shed pounds. Chia seeds are a great source of omega-3s, protein, and fiber — all of which can help suppress hunger. Some people swear by chia seeds as a diet tool, since the seeds swell with water to fill your stomach. Studies have shown that eating an egg or two for breakfast can help dieters feel more full over 24 hours than if they eat a bagel with the same amount of calories. In the same study, those who ate eggs ingested an average of 330 fewer calories over the course of a day than the bagel-eaters. Another excellent source of protein, yogurt has the added benefit of its fat-burning potential. Choose low- or nonfat Greek yogurt for added protein potential, and read more reasons to eat yogurt here. Eating something sour can help curb sweet cravings, helping you feel satisfied after a meal. Lemon juice also contains pectin, a type of soluble fiber that can help slow digestion and aid in weight loss. Studies have shown that people who ate soup as an appetizer ended up eating less throughout their meal. Just make sure you choose a broth-based soup over a high-fat creamy version. Beans are a low-calorie source of fiber and protein, so they are a good choice if you’re looking to stay full. Sneak some beans into your smoothies, burgers, and more with these recipes to help control between-meal hunger. When you eat fish like salmon that are high in omega-3 fatty acids, your body increases the amount of the hormone leptin in your system. Leptin is known for suppressing hunger. Don’t like salmon? Try tuna and herring, which are also high in omega-3s!